Nice clean display. Usnharp masking might bright legs out better, but you need high reso pics for that. In some photos the parhelia leg up from parhelion is seen as well. Parhelia leg up from parhelion? 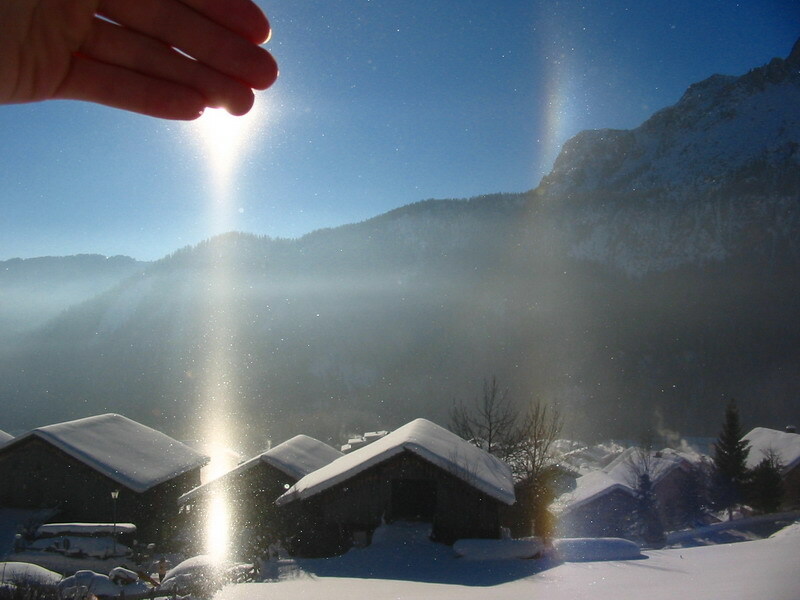 Is it "Schultz arc" (Lowitz arc) or new halo phenomena? Parhelia legs and Schultz arcs are the same phenomenon. They are caused by 3-2-5 (below parhelion) and 3-1-5 (above parhelion) raypaths in thin plates tilting (only little, say, 5 degs) about Lowitz axis. I call them as "reflected Lowitz arcs". There are no Lowitz arcs at all. I thought Scultz has photographed these arcs and I suggested the name "Schultz arcs". But then I realised they are most likely just parhelia: camera lens makes them lean outwards when located at the upper edge of frame (got similar effect myself). There are some difficulties in simulating reflected Lowitz arcs espacially in Walt's Fairbanks displays, but there are also examples of cases that follow the simulations well. So, everything has not been said on the subject and this all only my opinion.